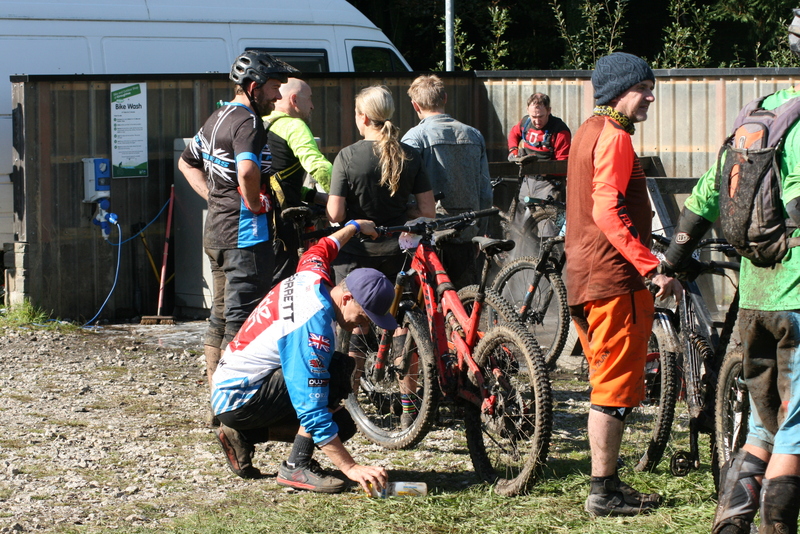 Deb did her bit for the UK race scene (yet again) at the PMBA Kirroughtree Enduro – supporting her local bike race by volunteering to marshal and was placed at the start of Stage 5, otherwise known as “The Really Hard Bit”…. Packing enough supplies for a week into the car at 7.30am is not my usual start to a Sunday. 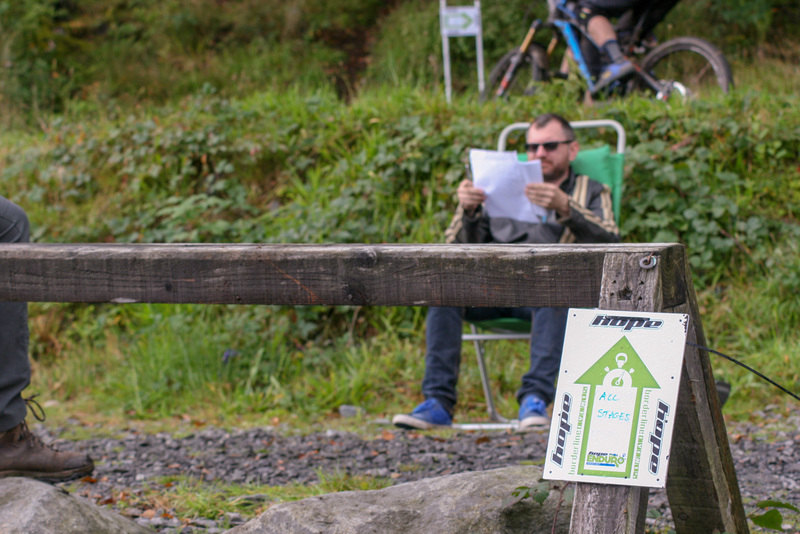 Once I’d arrived at the visitor centre and the marshal sign on and briefing was all done, our merry band of hi-viz wearing volunteers were all distributed around the 5 stages of the PMBA Enduro course. I was so glad I remembered the midge spray. I was responsible for the start of the final stage and had been placed at the top of a very steep, very slippery and very long downhill section through the dense forest. It felt a long way from anywhere but surprisingly it appears to be the only spot at Kirroughtree with an EE 4G signal. 12 months of living here and I’ve finally found it. 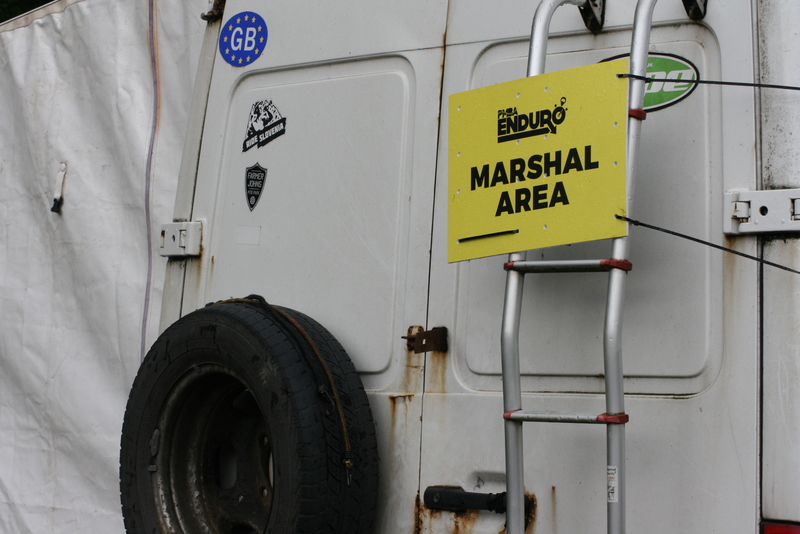 This was a rather daunting experience as the whole Enduro marshalling process was a first for me. I felt slightly out of my endurance mountain biking pit helper comfort zone. Riders soon started arriving for practice runs. I watched in admiration as time after time people attempted the slippy, rooty, rocky hairpin descent that was merely the beginning of the intimidating technical section. After a while I began to learn the line so well that I almost believed I could ride it myself. The range of rider ability was vast (as was the age range) but each and every rider had endless courage and determination. This was in spite of the occasional nerves and doubts creeping in as they waited the minimum of 20 seconds for the rider in front to clear off. I wished I had had more than the regulation 20 seconds to chat to them all but if I did I’d have been even later home and would have completely ruined everyone’s concentration. Team JMC – It’s not me! It seems that lots of people who I meet (and presumably lots of people who I haven’t met) think that ‘Team JMC’ is so-called because it’s named after me. Jason Miles Cycling, or possibly Jason Miles C….with a naughty word added on the end. It’s not. My ego may be the size of a wardrobe, but it’s hopefully not the size of an oil tanker. Once upon a time, there was a computer company in Manchester called JM Computing. 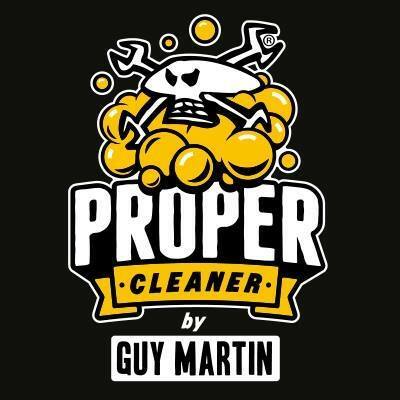 It wasn’t called that because it was named after me either, it was named after the 2 chaps that founded it. It’s not there now. It’s been swallowed up by a much bigger computer company but the name ‘JMC’, which is derived from that, lives on. 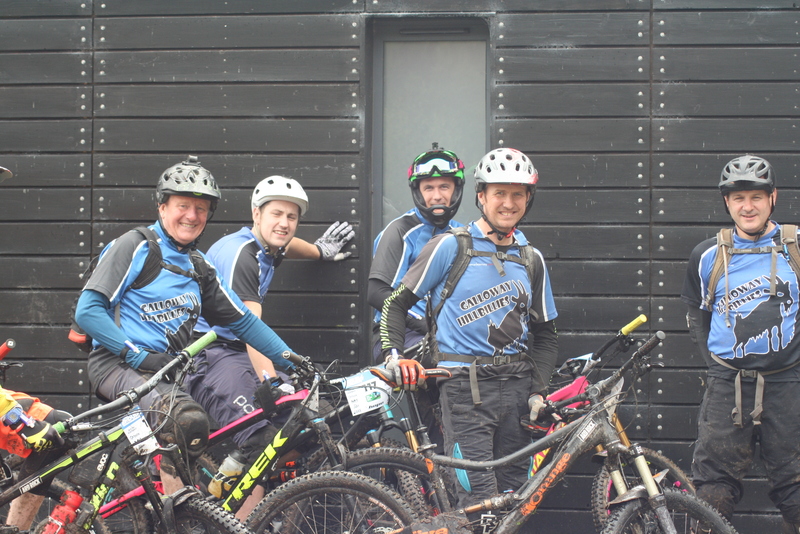 Team JMC was started as a bit of a fun, social thing and was basically people (like me) who worked at JM Computing all spending time with each other outside work, doing stuff like white water rafting, hiking, triathlons and mountain biking. Over time, things got more organised and for some, things got more serious. People started getting good at stuff. People who didn’t work at JM Computing joined in. ‘Ringers’ I think they’re more commonly known as. As the months went by, the distinctive blue, white and red cycling jerseys became more common and more recognised. Mainly because they were being photographed in races up and down the country, sometimes abroad and increasingly, on the steps of podiums. Now I’ve lost count of how many people have joined in, mainly because I’m not the guy who does the counting. But it’s not my initials. It’s a complete coincidence that my initials and the logo on my biking jersey are the same. For what it’s worth, If I started my own race team I’d call it Team Chicken Biryani. So that clears that up then! Blogging a bit more often than I have been doing would seem to be the right thing to do, now I’ve kind of dragged my backside out of my endurance racing sabbatical. Perhaps someone out there is still interested in how many times a week I get soaked on a training ride or possibly would be half-bothered if I’ve bought a new pair of shoes or something. In the past few weeks I’ve ridden a 300 mile charity ride, a stage race in Spain, a painful duathlon (never again! ), a super-hilly gravel ride in Yorkshire and I’ve been welcomed by the local cycling lads and lasses (shout out to the Newton Stewart Thursday night bunch!) so I suppose it’s been a decent run so far. 2018 is already 100 times less shite than 2017. Since the first time I rolled my new Blur CC out of the house (and subsequently died on my arse) at the Glentress 7 over 11 weeks ago, I’ve gradually got my body and mind back into the routine of more regular big rides and more recently I’ve reminded myself what interval training feels like. Of course, it’ll all be absolutely fine – I’ve been here before and my level of enthusiasm seems pretty good for now so we’ll see how we get on. As well as all the help I’m surprisingly still enjoying from all my regular sponsors and supporters (and family) Dave is helping me along on the road to the 24 Hour World Champs in October – I’ve kind of got a bit bored of my regular training routine that I’d been using for years of 24 hour racing, so Dave’s pushing me harder and while the goals are the same, the preparation feels new and a lot more exciting. I can’t seem to be able to tell myself to break myself to pieces any more, I need someone to tell me to do it. Weird eh? 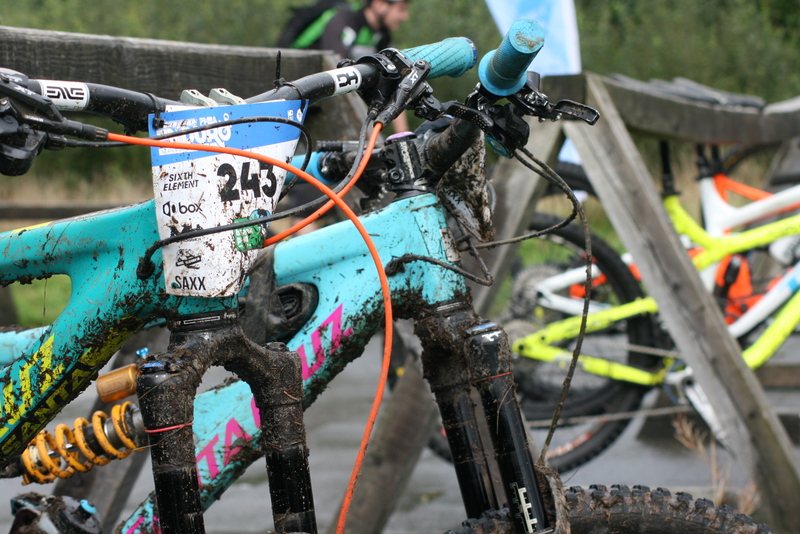 My journey back towards race fitness continued this weekend at the Glentress 7. 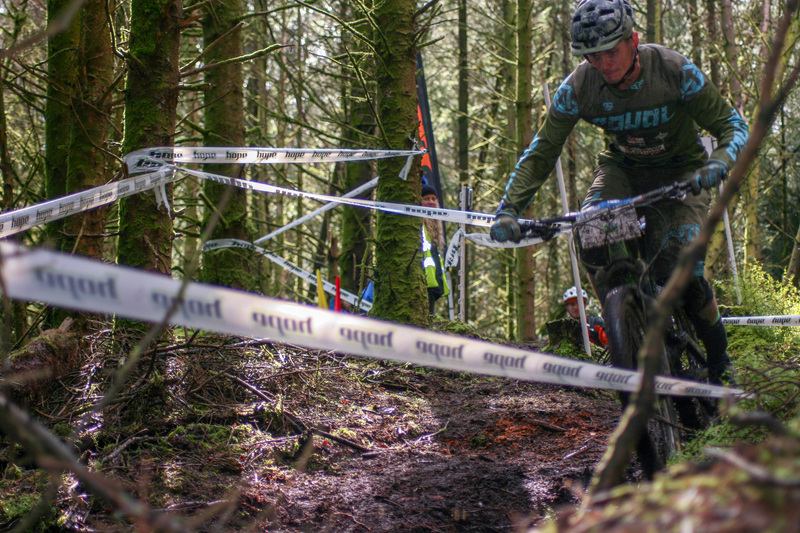 Unsurprisingly it’s a 7 hour race on a lapped course just up the road at the brilliant Glentress forest. There was little chance of me making an impact on a “short” 7 hour race on a technical course in 25-degree heat with my current weight and lack of race sharpness but it was going to be an ideal opportunity to get a big, hard ride in and to show off the new Santa Cruz Blur CC, get a good feel for it and to get it set up just as I want it. A couple of weeks ago Daz mentioned that the course was a rough one and that I’d be better off on a full suspension bike. It’s funny because years ago I used to race everything on a fully-rigid bike but nowadays things just seem to be more punishing and, well, bumpier. My gorgeous Blur CC arrived on Friday, the day before the race. That reminded me a bit of the time Brant sent me a new ‘cross bike the day before the 3 Peaks Cyclocross. That one arrived completely in bits (and I was quite proud of the fact that the only thing that fell off in the race was the bottle cage) so just putting the front wheel on the Blur this time was a relative luxury. But what a bike. Look at it! And it rides even better than it looks. So there I am on a brand-new bike, waiting for the start. I’d spent far too long chatting to everyone so missed the fact that everyone had lined up in the tightest, narrowest start line I’d ever seen. So I was at the back. Great start, Jase! 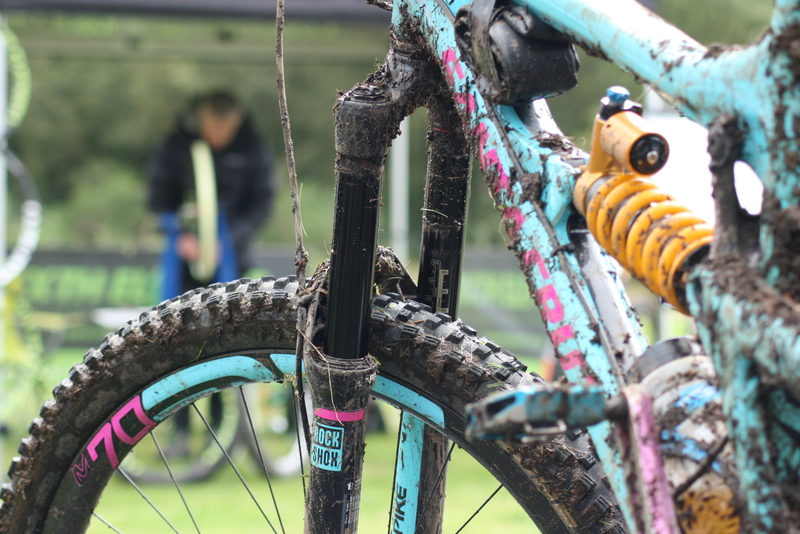 The first lap didn’t really open the pack up either – in fact I’d be amazed if I’d managed to overtake more than 20 riders but it was good to get a steady lap in at first because the course was pretty technical and the box-fresh bike needed a bit of shock pump lovin’. For the next 2 or 3 laps I just rode with the shock pump in my pocket and stopped every so often to twiddle with the setup until it felt bang-on. The whole time the bike felt amazing and my near-constant adjustments and (not ham-fisted, honest!) tweaks just made it better and better at handling all the roots, drops, singletrack and climbing that the race had to offer. Unsurprisingly my race result wasn’t anything to write home about, but results will take care of themselves with a few months of hard work and graft. In the coming weeks I’ll make some more changes to the bike’s setup but my god, even if I did nothing to it at all it’d still be a formidable weapon. Things are looking up.